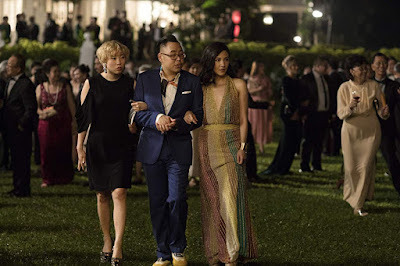 Though Jon M. Chu’s “Crazy Rich Asians”, based on Kevin Kwan’s 2013 book of the same name, is decidedly a rom-com, heavy on the com, a little too ineffectual in the rom, it often feels just as much like some old-fashioned Hollywood melodrama in its exploration of class and identity. The latter is what makes it so profound, then, that “Crazy Rich Asians” is the first Hollywood production since “The Joy Luck Club” 25 long years ago to feature an entirely Asian cast. Inserting this cast into a movie that easily could existed in the Golden Age, when an all-white cast would have been a foregone conclusion, merely illuminates the ease of representation. And in a way, the film’s resolute predictability is enhanced by that representation, a demonstration of anything you can do we can do just as well. And if “Crazy Rich Asians” leaves you wanting more as much as feeling satisfied, well, hey now, doesn’t every rom com? As “Crazy Rich Asians” opens, Nick Young (Henry Golding) asks his girlfriend Rachel Chu (Constance Wu) if she will come home with him to Singapore, not just to attend his best friend’s wedding but to meet his parents. If this sounds straightforward, it grows complicated as the aristocratic realities of Nick’s family gradually make themselves apparent to an increasingly overwhelmed Rachel. 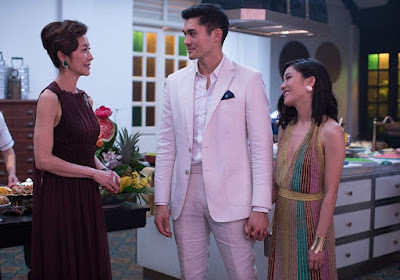 Those realities are intensified by Nick’s mother Eleanor (Michelle Yeoh), yearning not simply for her son to move home and assume control of the family business but to marry right, which means not marrying Rachel. If this generates tension, it is rarely felt between Rachel and Nick, not least because Golding’s overly polite performance fails to evince any internal anguish this position as unwilling heir would seem to suggest. Of course, ten million movie rom coms have left the female character out in the cold, and so perhaps this is poetic justice, since the real tension is within Rachel, and between Rachel and Eleanor. The latter is glimpsed straight away in mom and significant other meeting in the kitchen at a lavish family party where Eleanor continually interrupts their getting-to-know-you chit-chat, tending to a plate of food or consulting with a cook without so much as an “excuse me”, signaling her role as party host comes first, before labeling Rachel’s pursuing of her passion as “American.” It’s a wicked line reading by Yeoh, one verbally putting an icepick in the age-old notion of having it all, and it lays bare the dividing line between Asian and Asian-American values. That dividing line was apparently examined in greater detail in Kwan’s book, and you wish the movie delved it into more deeply. A comical moment in which a character scolds a child for not finishing his meal by saying “There are starving children in America” seems ripe for all sorts of societal unpacking but is merely left as a punchline. Indeed, there is so much opulence left unscrutinized that the film might have just floated away into excess, like Baz Luhrmann’s version of “The Great Gatsby”, if not for Yeoh, who evokes less cutout villainy than resiliency in a cultural belief that familial obligations supersede independence. You see this, too, in Astrid (Gemma Chan), the Youngs’ oldest daughter, who is introduced hiding purchases from her husband for fear of financially emasculating him, setting the tone for a subplot in which she suffers through him projecting all his insecurities onto her. Maybe I was just yearning for her to wield a nine iron, Elin Nordegren style, but the sadness of her subplot seemed for more than a Prince Charming-ish wrap-up. If Astrid is evocative of what comes with old money, Rachel’s best friend Peik Lin Goh is evocative of the insecurities of the new. She is played by the Asian-American Awkwafina, who only fails to steal the movie outright because of Yeoh. Compared to the asinine narrative constrictions of the misguided “Ocean’s 8”, here Awkwafina is unleashed, giving the interloping nature of the nouveau riche a wry self-effacement but also a distance from the real thing affording acerbic observation of how the system works; she is the living embodiment of the old Chris Rock bit about the difference between rich and wealthy. She is not just comic relief, however, but the conscious, pushing Rachel toward a better self, particularly in prompting her friend to get done up for Nick’s best friend’s wedding which doesn’t play like Pygmalion but Rachel reveling in her own power. The film’s climactic moment, in fact, is not the airplane proposal torn from a thousand rom coms but Rachel pinning Eleanor to a spot between a rock and a hard place over a game of Mahjong. You almost wish the movie could have ended there. Then again, in the wake of the airplane proposal torn from a thousand rom coms, Yeoh gets one more moment, seen from a distance, a respectful look in Rachel’s direction, that is not unlike the one the athlete gives the other athlete in a sports movie upon being competitively vanquished though Yeoh, brilliantly, withholds in such a way that she isn’t tipping the cap so much as waving a variation of a white flag. She’s been bested. The game’s changed. Watching that, I wondered if maybe one day the same expression would apply to Hollywood’s white-centric casting agents.